Ijen Crater Blue Fire Tour Package 2 Days 1 Night. Tour program enjoying view blue fire or blue flame at ijen crater with durations trip 2 days 1 night starting point pick up from Surabaya,Malang,Ketapang Banyuwangi or Bali. Kawah Ijen or Ijen crater is a mountain that lies between Bondowoso and Banyuwangi part of the province of East Java, Indonesia. Travel Ijen Crater has an area of about 365 mtr with a lake surface area of about 0, 45 square km. lake of Ijen crater itself has a depth of about 200 mtr and has a volume reaches 36 cubic hectometres and has an acidity of 0.5 PH. On the edge of the crater lake you will find a vent pipe which is a source of elemental sulfur from Mount Ijen. Liquid sulfur from the mountain be piped from pipe shaped liquid sulfur that are red, slowly flowing from the ends of the pipe and then turned into yellow. Some miners solve the sulfur hardened it with a hammer be a small pieces and cooled with water and then transported by cart to be brought to the shelter post sulfur. Each sulfur miner in Ijen crater carrying the burden on their shoulders weighing between 75-90 kg, heading about 300 meters to the edge of the crater, the slope of the road from 45-60 degrees and then proceed on foot as far as 3 kilometers with the terrain decreases for weighed. 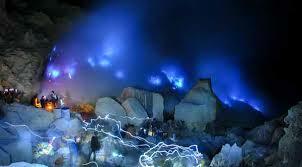 In a day and the average miners 2 times transporting the sulfur from the crater of Mount Ijen. Ijen Blue Fire Tour is one Package climbing in East Java, which attracted the attention of local and foreign tourists in addition to selecting a bromo tour package or semeru trekking. Climbing or trekking to Mount Ijen to view blue fire begins at midnight from the post Paltuding with a long climb to the crater of Mount Ijen 1.5 to 2 hours climb and as far 3 km. We will pick you up in accordance with the agreement, for example from the hotel, airport, station, harbor or terminal in Surabaya / Malang / Pobolinggo / Banyuwangi Ketapang or Bali. Then proceed to the tourist area of Ijen crater. Arriving village Sempol / Blawan. Chek in lodging, or hotel nearest to Mount Ijen and free program. The climb to the summit crater of Ijen to see Blue Fire started at 12 am, driving from the hotel to the post Patulding, the last post for all the tourists in the crater of Ijen start climbing. Ascent to the crater of Ijen takes about 1.5 hours walking. Arriving at the top of the mountain and then down to the lake Ijen Ijen mountain to enjoy the beautiful blue fire (blue flame) arising from the burning of sulfur. Satisfied enjoy a tour ijen blue fire back to the hotel, shower, eat breakfast and check out. Then our staff will drive back to the location accordance with the agreement. Arrived on the location of accordance with the agreement, Ijen Crater Blue Fire Package Tour finished. Ijen Blue Fire Package Tour 2 Days 1 Night, a program tour packages for visiting the natural beauty of blue fire (blue flame) which is rare because in the world there are only two places one of them at Mount Ijen Banyuwangi.